click image for close-up By 1845, around the time that this photo was taken, antislavery conventions were common throughout the northern states and attended by enthusiastic crowds. According to a story published in the Cazenovia Republican forty years later, this convention, held possibly in Cazenvoia, New York, was "a thrilling event and. . . made a great sensation thoughout the country." 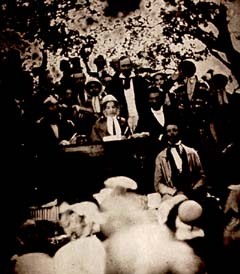 Prominent abolitionists attended the meeting, including Gerrit Smith, who is shown with arms extended, and Frederick Douglass, seated in front of Smith. William Chaplain, a conductor of the Underground Railroad, was scheduled to be present at this convention, and had even planned to bring along six fugitives that he was escorting to freedom. He and the slaves, however, were captured in Washington. Chaplain was imprisoned and the slaves returned to the South. When news of the capture was announced at the meeting, a "dramatic scene" ensued, and a collection was taken for Chaplain.